One would appear that when Stephen Morris and the Miami Hurricanes clinched bowl elgibility on Saturday after blowing out South Florida. But this morning, in an attempt to get ahead of sanctions from the Nevin Shapiro scandal and a hope to lessen said sanctions, the university has decided for the second straight year to impose a bowl ban in a move the school refers to as "unprecedented." Now normally I would not have a problem with this move; the Hurricanes are not looking to get into a major bowl so trying through this move to possibly get a lesser penalty from the NCAA would make sense. But I do think this is a mistake and here is why. First off, I do not like announcing a bowl ban this late in the season. The school knew about potential sanctions down the line before the season so why wait until now to do so? 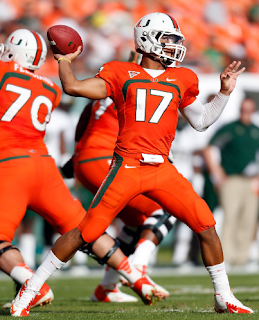 If the Canes were a BCS contender, would they have made this move this late in the season? Of course not. Actually, technically the U is a BCS contender because if they win Saturday against Duke, they would be in the ACC Championship Game against their rival, Florida State. Now, after the Seminoles beat down Miami earlier in the season, you would think that that may happen again but there is still that shot to get to the Orange Bowl. By making the bowl ban this late in the season, you are taking away a chance to get to the Orange Bowl when it is right in front of the players. That certainly is not fair to the players. Now, Miami has a pretty young team with talent so it may be wise to take the ban now if they are an ACC title contender down the road but I just don't like them taking a bowl ban this late in the season with an outside shot to get to the Orange Bowl.